how to send text and emoticon/image(not the default emojis,images in asset folder) written together in a edittext to send message and chat as it is appearing in that edittext. p.s I am sending those images in mail or message body. When i send any image it will apear like this "[obj]". How to solve it please help me. 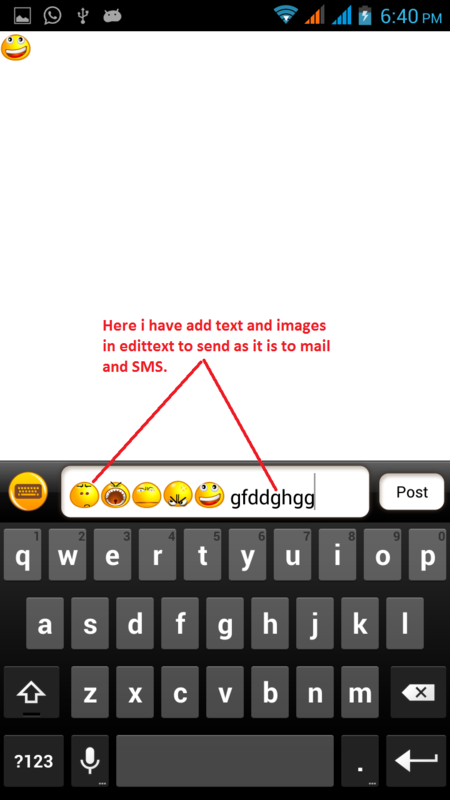 As I am creating an emoji softkeyboard for all apps like facebook,whats app , etc. These unicode are already implemented on facebook,whats app and they easily behave according. then try this way . But i recommend you sending by unicodes because all apps know how to react after recieving these codes. Not the answer you're looking for? Browse other questions tagged android image email textview sms or ask your own question.